Progress in the 20th and 21st centuries has been unprecedented in human history. We have computers, cell phones, satellite communications, drugs, plastics, and more that pervade our lifestyle. Most of it for the better. There are more than 70,000 chemicals in regular use in the developed countries of the world, of which a woman applies 515 chemicals to her body daily in the form of cleansers and makeup. There are 287 of those chemicals found in the umbilical blood of newborn infants in America. We have opened Pandora’s box with the unrestrained use of chemicals and plastics in our world. There is now an island of plastic waste in the middle of the Pacific Ocean the size of Mexico. We need to treat our planet and our bodies with more respect. The results of rampant unbridled use of chemicals has been havoc on our health. Hormone disruptors, also called endocrine disruptors are chemicals that disturb the normal workings of the endocrine system. They do this by mimicking certain hormones such as estrogen, causing overproduction of some hormones and underproduction of others. This leads to hormonal imbalance which causes early puberty in girls besides other adverse health issues. Various studies have shown that hormonal disruptors can also cause infertility; developmental malformations, tamper with our immune system, and increase the risks of developing cancer. But where do these chemicals come from? Plastics are a major source of hormone disruptors. In the modern environment, plastics are in every aspect of life. From plastic carrier bags, to water bottles, to food containers, and clothing, it is impossible to spend any amount of time without interacting with plastic. And while direct contact with plastic affects us, the plastic problem is larger with plastics finding their way into land and water bodies, and ultimately into food. Personal care products like lotions, shampoos and cleaning agents have been tested and seen to contain traces of hormone disrupters. Various samples taken from different bottled water brands found traces of hormone disrupting chemicals. This is mainly due to contamination of water sources with chemicals that are able to survive the filtration process. Additionally, the some parts of the plastic used in making the bottles end up in the water. Conventionally grown fruits, vegetables and animals are continually exposed to various chemicals in form of herbicides, pesticides, fertilizers, antibiotics and preserves in a bid to reduce the risks and maximize production. Mineral Deficiencies. What Is Your Soil Missing? In addition to containing disruptive chemicals from the growing process, canned foods contain more chemicals used to prolong their shelf lives. Many food containers, from microwave popcorn bags to many cans, are lined with bisphenol A (BPA) as a non-stick substance, which also plays havoc on the human hormonal system. The chemicals contained in the non-stick coating poses danger to users of such cookware. Some insect repellants normally used in households have also been found to contain dangerous hormone disrupting chemicals. How Safe Are GMOs? Various fish, including predatory fish such as shark and swordfish accumulate mercury and other contaminants from the water bodies where they live. These contaminants come from industries and homes, do a loop and end up in human food causing contamination and hormonal disruption, cancers and even death. Having explored some of the sources of hormone disruptors, the next issue is the specific causes of disruption and their effects on our health. Also called bisphenol-A, BPA is one of the better known and most abundant hormone disruptors in the world. It is so abundant that in fact studies show that 90% of Americans have it in their systems. The main source of BPA is plastic. It is in fact the reason why plastics stand out as a source of hormone disrupters. When BPA gets into your system, your body mistakes it for estrogen which leads to hormonal imbalance. BPA causes early puberty, breast cancer, asthma and heart diseases. It can also cause low testosterone production in males. This is a chemical that is quite common as it is found in various household items. It is added to plastic to make it flexible and is as such found in items ranging from pacifiers to beauty products. You should therefore avoid products made from PVC. Read through product labels and watch out for ‘phthalates ‘or in some cases just called ‘fragrance’. Phthalates are said to cause thyroid dysfunction, ADHD, obesity and diabetes. Being quite a well known poison, you’d be surprised to know that some foods contain arsenic in their ingredients. But not to be alarmed, organic arsenic – that occurs in nature – is not the issue. 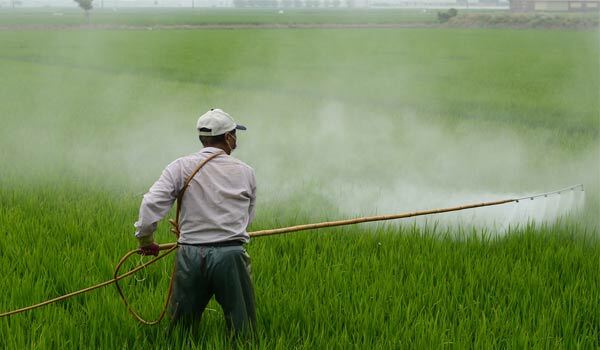 Inorganic arsenic, which is synthesized for use in pesticides, is the toxic one. This arsenic gets to us by sipping into water sources and ending up as bottled water. Arsenic has been found to activate certain estrogen regulating genes and is linked to lung, skin and even prostrate cancers. It mainly ends up in nature as a result of industrial processes such as gold mining and cement making. Mercury is specifically abundant in marine life, occurring in over 80% of the world’s fish. Mercury poisoning has been linked to liver and kidney failure, impaired development in children and even hair loss. There is no known safe level of mercury in the human body. Mercury as a preservative in vaccines has been linked to autism and other neurological disorders. This is a chemical mostly used in the manufacture of herbicides. Once sprayed, it gets into the soil and when the rains come, it is taken by the rain water and ends up in rivers, lakes and oceans. Experiments done on atropine have shown shocking results with small doses turning male frogs into females. Atropine is said to cause birth defects, delayed puberty and prostrate diseases. This is another chemical that occurs in both nature and as a result of industrial processes. People are mainly exposed to dioxin through meat and dairy products since it is stored in animal fatty tissue. This is another well known hormone disrupting poison. Lead has been banned from use in many products such as paint for years. However, traces of lead can still be found in the environment and in old paint and as such still pauses a threat to our health. Lead causes brain damage, liver and kidney failure and high blood pressure. This chemical is mainly found in fireworks. It is a hormone disruptor which has been found in water sources. Its main effects include thyroid damage and slow development of babies. Glycol ether is an ingredient found in paint, cleaning agents and even beauty products where it is used as a solvent. The effects of glycol ether include causing infertility in males, allergies and problems with the development of a fetus. The first thing would be to avoid plastics as much as you can, especially when it involves your food. Whether it’s bottled water or even rated ‘microwave safe’ avoid it whenever you can. Avoid eating predatory fish and opt for low mercury fish like salmon, sardines and herring instead. Find an alternative to non-stick cookware in your kitchen. Cast iron or stainless steel are good enough. Try as much as you can to eat organic foods, including organically raised meat. Steer clear of shampoos and other cosmetic products which contain mysterious ingredients that can be catastrophic to your health. Use organic insecticides or don’t use them at all. Most of these insecticides work by impairing the nervous system function of insects. This is what makes them so effective, and in the same way can eventually affect yours.